Definition at line 41 of file CTSSAMethod.h. Definition at line 74 of file CTSSAMethod.cpp. Definition at line 126 of file CTSSAMethod.cpp. Definition at line 177 of file CTSSAMethod.cpp. Definition at line 1867 of file CTSSAMethod.cpp. References C_FLOAT64, C_INT, CModel::calculateDerivatives(), CTSSAMethod::Data::dim, CModel::getCompartments(), CModel::getMetabolites(), CModel::getNumber2QuantityFactor(), CModel::getQuantity2NumberFactor(), mData, mpModel, mReducedModel, CVector< CType >::resize(), and CModel::updateSimulatedValues(). Definition at line 1824 of file CTSSAMethod.cpp. References C_FLOAT64, CModel::calculateDerivativesX(), CModel::getCompartments(), CModel::getMetabolitesX(), CModel::getNumber2QuantityFactor(), CModel::getNumIndependentReactionMetabs(), CModel::getQuantity2NumberFactor(), mpModel, mReducedModel, CVector< CType >::resize(), and CModel::updateSimulatedValues(). Referenced by CILDMMethod::deuflhard(), CILDMModifiedMethod::deuflhard_metab(), CILDMMethod::newton(), CILDMModifiedMethod::newton_for_timestep(), CILDMModifiedMethod::newton_new(), and CILDMModifiedMethod::step(). Create the CArraAnnotations for every ILDM-tab in the CQTSSAResultSubWidget. Input for each CArraAnnotations is a separate CMatrix. Definition at line 2191 of file CTSSAMethod.cpp. Create a time scale separation analysis method for a special problem. Note: the returned object has to be released after use with delete a problem is also passed so that the method has a chance to choose an appropriate simulation method. CTSSAMethod class. This class describes the interface to all time scale separation analysis methods. The various method like ILDM or CSP have to be derived from this class. Definition at line 44 of file CTSSAMethod.cpp. References fatalError, CCopasiMethod::tssCSP, CCopasiMethod::tssILDM, CCopasiMethod::tssILDMModified, and CCopasiMethod::unset. Referenced by CQTSSAWidget::createMethod(), and CTSSATask::createMethod(). Definition at line 420 of file CTSSAMethod.cpp. Definition at line 2178 of file CTSSAMethod.cpp. Definition at line 2128 of file CTSSAMethod.cpp. Definition at line 2131 of file CTSSAMethod.cpp. References CModel::calculateDerivatives(), CModel::calculateDerivativesX(), mpModel, mpState, mReducedModel, CModel::setState(), CState::setTime(), and CModel::updateSimulatedValues(). Definition at line 2160 of file CTSSAMethod.cpp. Definition at line 103 of file CTSSAMethod.h. Referenced by CQTSSAResultSubWidget::changeInterval(), and CQTSSAResultSubWidget::slotTableChanged(). Definition at line 100 of file CTSSAMethod.h. Definition at line 2169 of file CTSSAMethod.cpp. Definition at line 2104 of file CTSSAMethod.cpp. References CVectorCore< CType >::array(), CStateTemplate::beginIndependent(), C_FLOAT64, CTSSAMethod::Data::dim, CMetab::getCompartment(), CModel::getQuantity2NumberFactor(), CModel::getStateTemplate(), CModelEntity::getValue(), mAtol, mData, mpModel, CVector< CType >::resize(), and CVectorCore< CType >::size(). Definition at line 327 of file CTSSAMethod.cpp. 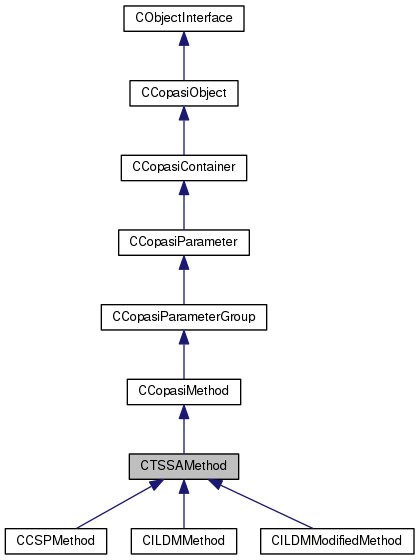 References CCopasiParameterGroup::assertParameter(), CCopasiParameter::BOOL, C_FLOAT64, C_INT32, CModel::getCompartments(), CCopasiDataModel::getModel(), CCopasiObject::getObjectDataModel(), CCopasiParameterGroup::getParameter(), CModel::getQuantity2NumberFactor(), CCopasiParameter::getValue(), max, CCopasiParameter::Value::pBOOL, CCopasiParameter::Value::pUDOUBLE, CCopasiParameter::Value::pUINT, CCopasiParameterGroup::removeParameter(), CCopasiParameterGroup::setValue(), CCopasiVector< T >::size(), CCopasiParameter::UDOUBLE, and CCopasiParameter::UINT. Referenced by CILDMMethod::initializeParameter(), CILDMModifiedMethod::initializeParameter(), and CCSPMethod::initializeParameter(). 365 // Check whether we have a method with "Use Default Absolute Tolerance"
409 // These parameters are no longer supported. Reimplemented in CCSPMethod, CILDMModifiedMethod, and CILDMMethod. Definition at line 324 of file CTSSAMethod.cpp. Definition at line 2055 of file CTSSAMethod.cpp. References CState::beginIndependent(), CTSSAMethod::Data::dim, CCopasiProblem::getModel(), CModel::getNumDependentReactionMetabs(), CState::getNumIndependent(), CState::getTime(), initializeAtol(), mData, mDWork, mErrorMsg, mIWork, mJacobian, mJType, mLSODA, mLsodaStatus, mpModel, mpProblem, mpState, mReducedModel, mRtol, mState, mTime, mY, mYdot, pdelete, CMatrix< CType >::resize(), CVector< CType >::resize(), and CInternalSolver::setOstream(). Referenced by CILDMMethod::start(), CILDMModifiedMethod::start(), and CCSPMethod::start(). Definition at line 426 of file CTSSAMethod.cpp. References CVectorCore< CType >::array(), C_FLOAT64, C_INT, CTSSAMethod::Data::dim, EvalF(), CCopasiMessage::EXCEPTION, mAtol, MCTrajectoryMethod, mData, mDWork, mErrorMsg, mIWork, mJType, mLSODA, mLsodaStatus, mpCurrentState, mpState, mRtol, mState, mTime, mY, CState::setTime(), and CVectorCore< CType >::size(). Referenced by CILDMMethod::step(), CILDMModifiedMethod::step(), and CCSPMethod::step(). 462 // Why did we ignore this error? Definition at line 227 of file CTSSAMethod.cpp. References CModelEntity::ASSIGNMENT, CCopasiVector< T >::begin(), CCopasiVector< T >::end(), CCopasiMessage::ERROR, fatalError, CModel::getCompartments(), CModel::getEvents(), CModel::getMetabolites(), CCopasiProblem::getModel(), CModel::getModelValues(), CModel::getNumAssignmentMetabs(), CModel::getNumODEMetabs(), CCopasiMethod::getSubType(), CCopasiMethod::isValidProblem(), MCCopasiMethod, MCTSSAMethod, mData, CModelEntity::ODE, CTSSAMethod::Data::pMethod, CCopasiVector< T >::size(), CCopasiMethod::tssCSP, CCopasiMethod::tssILDM, and CCopasiMethod::tssILDMModified. Definition at line 1910 of file CTSSAMethod.cpp. Definition at line 1973 of file CTSSAMethod.cpp. References C_FLOAT64, C_INT, and min. Definition at line 622 of file CTSSAMethod.cpp. References C_FLOAT64, C_INT, CTSSAMethod::Data::dim, mData, mTdInverse, mVfast_space, and CMatrix< CType >::resize(). Referenced by CILDMModifiedMethod::deuflhard_metab(), CILDMMethod::step(), and CILDMModifiedMethod::step(). Definition at line 680 of file CTSSAMethod.cpp. References C_FLOAT64, C_INT, CTSSAMethod::Data::dim, CModel::getCompartments(), CModel::getNumber2QuantityFactor(), mData, mpModel, mQ, mVfast_space, mY_initial, and CVector< CType >::resize(). Definition at line 530 of file CTSSAMethod.cpp. References C_INT, CTSSAMethod::Data::dim, mData, mTd, mVslow_metab, and CVector< CType >::resize(). Referenced by CILDMMethod::step(), and CILDMModifiedMethod::step(). This is not very elegant solution. But I don't know the better one. Definition at line 485 of file CTSSAMethod.cpp. References C_INT, CTSSAMethod::Data::dim, mData, mTdInverse, mVslow, CMatrix< CType >::resize(), and CVector< CType >::resize(). Definition at line 564 of file CTSSAMethod.cpp. References C_FLOAT64, C_INT, CTSSAMethod::Data::dim, mData, mTdInverse, mVslow_space, and CMatrix< CType >::resize(). Definition at line 741 of file CTSSAMethod.cpp. References C_FLOAT64, C_INT, CTSSAMethod::Data::dim, mData, and mTdInverse. Definition at line 221 of file CTSSAMethod.cpp. Referenced by CTSSATask::initialize(), and CTSSATask::updateMatrices(). Definition at line 316 of file CTSSAMethod.cpp. Definition at line 760 of file CTSSAMethod.cpp. References CVectorCore< CType >::array(), C_INT, dgees_(), CTSSAMethod::Data::dim, dtrexc_(), fatalError, CCopasiMethod::getSubType(), map_index(), mData, mJacobian_initial, mQ, mR, CTSSAMethod::Data::pMethod, CVector< CType >::resize(), CCopasiMethod::tssCSP, CCopasiMethod::tssILDM, CCopasiMethod::tssILDMModified, update_nid(), and update_pid(). Referenced by CCSPMethod::cspstep(), CILDMMethod::step(), and CILDMModifiedMethod::step(). 779 * Schur vectors Z. This gives the Schur factorization A = Z*T*(Z**T). 782 * real Schur form so that selected eigenvalues are at the top left. 784 * invariant subspace corresponding to the selected eigenvalues. 792 * where b*c < 0. The eigenvalues of such a block are a +- sqrt(bc). 799 * = 'V': Schur vectors are computed. 803 * diagonal of the Schur form. 805 * = 'S': Eigenvalues are ordered (see SELECT). 808 * SELECT must be declared EXTERNAL in the calling subroutine. 810 * to the top left of the Schur form. 811 * If SORT = 'N', SELECT is not referenced. 815 * eigenvalues are selected. 820 * case INFO is set to N+2 (see INFO below). 823 * The order of the matrix A. N >= 0. 826 * On entry, the N-by-N matrix A. 827 * On exit, A has been overwritten by its real Schur form T.
830 * The leading dimension of the array A. LDA >= max(1,N). 833 * If SORT = 'N', SDIM = 0. 843 * that they appear on the diagonal of the output Schur form T.
846 * imaginary part first. 851 * If JOBVS = 'N', VS is not referenced. 855 * JOBVS = 'V', LDVS >= N.
858 * On exit, if INFO = 0, WORK(1) contains the optimal LWORK. 861 * The dimension of the array WORK. LWORK >= max(1,3*N). 862 * For good performance, LWORK must generally be larger. 867 * message related to LWORK is issued by XERBLA. 870 * Not referenced if SORT = 'N'. 874 * < 0: if INFO = -i, the i-th argument had an illegal value. 880 * to its partially converged Schur form. 887 * could also be caused by underflow due to scaling. 1031 * moved to row ILST. 1035 * is updated by postmultiplying it with Z. 1040 * off-diagonal elements of opposite sign. 1047 * = 'N': do not update Q. 1050 * The order of the matrix T. N >= 0. 1054 * Schur canonical form. 1056 * in Schur canonical form. 1059 * The leading dimension of the array T. LDT >= max(1,N). 1062 * On entry, if COMPQ = 'V', the matrix Q of Schur vectors. 1064 * orthogonal transformation matrix Z which reorders T.
1065 * If COMPQ = 'N', Q is not referenced. 1068 * The leading dimension of the array Q. LDQ >= max(1,N). 1072 * Specify the reordering of the diagonal blocks of T.
1074 * sequence of transpositions between adjacent blocks. 1078 * position (which may differ from its input value by +1 or -1). 1079 * 1 <= IFST <= N; 1 <= ILST <= N.
1089 * current position of the block being moved. Definition at line 1187 of file CTSSAMethod.cpp. References CVectorCore< CType >::array(), C_INT, dgees_(), CTSSAMethod::Data::dim, dtrexc_(), map_index_desc(), mData, mJacobian_initial, mQ_desc, mR_desc, CVector< CType >::resize(), update_nid(), and update_pid(). 1206 * Schur vectors Z. This gives the Schur factorization A = Z*T*(Z**T). 1209 * real Schur form so that selected eigenvalues are at the top left. 1211 * invariant subspace corresponding to the selected eigenvalues. 1219 * where b*c < 0. The eigenvalues of such a block are a +- sqrt(bc). 1226 * = 'V': Schur vectors are computed. 1230 * diagonal of the Schur form. 1232 * = 'S': Eigenvalues are ordered (see SELECT). 1235 * SELECT must be declared EXTERNAL in the calling subroutine. 1237 * to the top left of the Schur form. 1238 * If SORT = 'N', SELECT is not referenced. 1242 * eigenvalues are selected. 1247 * case INFO is set to N+2 (see INFO below). 1250 * The order of the matrix A. N >= 0. 1253 * On entry, the N-by-N matrix A. 1254 * On exit, A has been overwritten by its real Schur form T.
1257 * The leading dimension of the array A. LDA >= max(1,N). 1260 * If SORT = 'N', SDIM = 0. 1270 * that they appear on the diagonal of the output Schur form T.
1273 * imaginary part first. 1278 * If JOBVS = 'N', VS is not referenced. 1282 * JOBVS = 'V', LDVS >= N.
1285 * On exit, if INFO = 0, WORK(1) contains the optimal LWORK. 1288 * The dimension of the array WORK. LWORK >= max(1,3*N). 1289 * For good performance, LWORK must generally be larger. 1294 * message related to LWORK is issued by XERBLA. 1297 * Not referenced if SORT = 'N'. 1301 * < 0: if INFO = -i, the i-th argument had an illegal value. 1307 * to its partially converged Schur form. 1314 * could also be caused by underflow due to scaling. 1431 * moved to row ILST. 1435 * is updated by postmultiplying it with Z. 1440 * off-diagonal elements of opposite sign. 1447 * = 'N': do not update Q. 1450 * The order of the matrix T. N >= 0. 1454 * Schur canonical form. 1456 * in Schur canonical form. 1459 * The leading dimension of the array T. LDT >= max(1,N). 1462 * On entry, if COMPQ = 'V', the matrix Q of Schur vectors. 1464 * orthogonal transformation matrix Z which reorders T.
1465 * If COMPQ = 'N', Q is not referenced. 1468 * The leading dimension of the array Q. LDQ >= max(1,N). 1472 * Specify the reordering of the diagonal blocks of T.
1474 * sequence of transpositions between adjacent blocks. 1478 * position (which may differ from its input value by +1 or -1). 1479 * 1 <= IFST <= N; 1 <= ILST <= N.
1489 * current position of the block being moved. Implemented in CCSPMethod, CILDMMethod, and CILDMModifiedMethod. Definition at line 180 of file CTSSAMethod.cpp. Definition at line 216 of file CTSSAMethod.cpp. Definition at line 190 of file CTSSAMethod.cpp. Definition at line 2184 of file CTSSAMethod.cpp. This instructs the method to calculate a a time step of deltaT starting with the initialState given. The new state (after deltaT) is expected in the current state. The return value is the actual time step taken. Definition at line 213 of file CTSSAMethod.cpp. This instructs the method to calculate a a time step of deltaT starting with the current state, i.e., the result of the previous step. The new state (after deltaT) is expected in the current state. The return value is the actual time step taken. Definition at line 201 of file CTSSAMethod.cpp. Referenced by CTSSATask::processStep(), and returnCurrentTime(). Definition at line 1587 of file CTSSAMethod.cpp. References CVectorCore< CType >::array(), C_FLOAT64, C_INT, CTSSAMethod::Data::dim, dtrsyl_(), mData, mJacobian_initial, mQ, mQz, mR, mTd, mTdInverse, CMatrix< CType >::resize(), and CVector< CType >::resize(). 1651 * <= 1 to avoid overflow in X. 1656 * off-diagonal elements of opposite sign. 1680 * matrices X and C. M >= 0. 1684 * matrices X and C. N >= 0. 1687 * The upper quasi-triangular matrix A, in Schur canonical form. 1690 * The leading dimension of the array A. LDA >= max(1,M). 1693 * The upper quasi-triangular matrix B, in Schur canonical form. 1696 * The leading dimension of the array B. LDB >= max(1,N). 1699 * On entry, the M-by-N right hand side matrix C.
1700 * On exit, C is overwritten by the solution matrix X. 1706 * The scale factor, scale, set <= 1 to avoid overflow in X. 1713 * A and B are unchanged). Definition at line 2024 of file CTSSAMethod.cpp. Referenced by schur(), and schur_desc(). Definition at line 2041 of file CTSSAMethod.cpp. Definition at line 97 of file CTSSAMethod.h. Referenced by CILDMModifiedMethod::createAnnotationsM(), CILDMMethod::createAnnotationsM(), CCSPMethod::createAnnotationsM(), and getTable(). A vector of absolute tolerances. Definition at line 301 of file CTSSAMethod.h. Referenced by initializeAtol(), and integrationStep(). Definition at line 250 of file CTSSAMethod.h. Referenced by CILDMMethod::deuflhard(), CILDMMethod::newton(), and CILDMMethod::step(). Definition at line 466 of file CTSSAMethod.h. Referenced by CILDMModifiedMethod::emptyVectors(), CILDMMethod::emptyVectors(), CCSPMethod::emptyVectors(), getCurrentStep(), CILDMModifiedMethod::setVectors(), CILDMMethod::setVectors(), CCSPMethod::setVectors(), CCSPMethod::setVectorsToNaN(), CILDMMethod::step(), CILDMModifiedMethod::step(), and CCSPMethod::step(). Definition at line 460 of file CTSSAMethod.h. Referenced by returnCurrentTime(), CILDMModifiedMethod::setVectors(), CILDMMethod::setVectors(), CCSPMethod::setVectors(), and CCSPMethod::setVectorsToNaN(). mData.dim is the dimension of the ODE system. Definition at line 180 of file CTSSAMethod.h. Referenced by calculateDerivatives(), CCSPMethod::CCSPMethod(), CILDMMethod::CILDMMethod(), CILDMModifiedMethod::CILDMModifiedMethod(), CILDMMethod::deuflhard(), CILDMModifiedMethod::deuflhard_metab(), initializeAtol(), integrationMethodStart(), integrationStep(), isValidProblem(), mat_anal_fast_space(), mat_anal_fast_space_thomas(), mat_anal_metab(), mat_anal_mod(), mat_anal_mod_space(), CILDMMethod::newton(), CILDMModifiedMethod::newton_for_timestep(), CILDMModifiedMethod::newton_new(), orthog(), CILDMModifiedMethod::printResult(), CCSPMethod::printResult(), schur(), schur_desc(), CILDMModifiedMethod::setAnnotationM(), CILDMMethod::setAnnotationM(), CCSPMethod::setAnnotationM(), CILDMModifiedMethod::setVectors(), CILDMMethod::setVectors(), CCSPMethod::setVectors(), CCSPMethod::setVectorsToNaN(), CILDMMethod::start(), CILDMModifiedMethod::start(), CCSPMethod::start(), CILDMMethod::step(), CILDMModifiedMethod::step(), CCSPMethod::step(), and sylvester(). Definition at line 341 of file CTSSAMethod.h. Referenced by CILDMMethod::deuflhard(), CILDMModifiedMethod::deuflhard_metab(), CILDMMethod::start(), CILDMModifiedMethod::start(), and CILDMModifiedMethod::step(). Definition at line 321 of file CTSSAMethod.h. Referenced by integrationMethodStart(), and integrationStep(). Definition at line 346 of file CTSSAMethod.h. Referenced by CILDMMethod::deuflhard(), and CILDMMethod::step(). Definition at line 306 of file CTSSAMethod.h. Definition at line 326 of file CTSSAMethod.h. Definition at line 205 of file CTSSAMethod.h. Referenced by CCSPMethod::cspstep(), integrationMethodStart(), CILDMMethod::step(), CILDMModifiedMethod::step(), and CCSPMethod::step(). Definition at line 210 of file CTSSAMethod.h. Referenced by CCSPMethod::cspstep(), CILDMModifiedMethod::newton_for_timestep(), CILDMModifiedMethod::newton_new(), schur(), schur_desc(), CILDMMethod::step(), CILDMModifiedMethod::step(), and sylvester(). Definition at line 331 of file CTSSAMethod.h. Definition at line 311 of file CTSSAMethod.h. Definition at line 286 of file CTSSAMethod.h. Definition at line 50 of file CTSSAMethod.h. Referenced by integrationStep(), and setCurrentState(). Definition at line 336 of file CTSSAMethod.h. Referenced by calculateDerivatives(), calculateDerivativesX(), CCSPMethod::CSPImportanceIndex(), CCSPMethod::CSPOutput(), CCSPMethod::CSPParticipationIndex(), CCSPMethod::CSPradicalPointer(), CCSPMethod::cspstep(), CILDMMethod::deuflhard(), CILDMModifiedMethod::deuflhard_metab(), evalF(), initializeAtol(), integrationMethodStart(), mat_anal_fast_space_thomas(), CILDMMethod::newton(), CILDMModifiedMethod::newton_for_timestep(), CILDMModifiedMethod::newton_new(), CCSPMethod::predifineAnnotation(), CILDMModifiedMethod::printResult(), CCSPMethod::printResult(), CILDMModifiedMethod::setAnnotationM(), CILDMMethod::setAnnotationM(), CCSPMethod::setAnnotationM(), setModel(), CILDMMethod::setVectors(), CCSPMethod::setVectors(), CCSPMethod::setVectorsToNaN(), CCSPMethod::start(), CILDMMethod::step(), CILDMModifiedMethod::step(), and CCSPMethod::step(). A pointer to the time scale separation analysis problem. Definition at line 55 of file CTSSAMethod.h. Referenced by integrationMethodStart(), and setProblem(). Definition at line 175 of file CTSSAMethod.h. Referenced by evalF(), integrationMethodStart(), integrationStep(), CCSPMethod::~CCSPMethod(), CILDMMethod::~CILDMMethod(), and CILDMModifiedMethod::~CILDMModifiedMethod(). Definition at line 215 of file CTSSAMethod.h. Referenced by CCSPMethod::cspstep(), mat_anal_fast_space_thomas(), schur(), CILDMMethod::step(), CILDMModifiedMethod::step(), and sylvester(). Definition at line 216 of file CTSSAMethod.h. Referenced by schur_desc(), and CILDMMethod::step(). Definition at line 235 of file CTSSAMethod.h. Referenced by CILDMMethod::newton(), CILDMMethod::step(), CILDMModifiedMethod::step(), and sylvester(). Definition at line 220 of file CTSSAMethod.h. Referenced by CCSPMethod::cspstep(), CILDMModifiedMethod::deuflhard_metab(), schur(), CILDMModifiedMethod::setVectors(), CILDMMethod::setVectors(), CCSPMethod::setVectors(), CCSPMethod::setVectorsToNaN(), CILDMMethod::step(), CILDMModifiedMethod::step(), and sylvester(). Definition at line 221 of file CTSSAMethod.h. Definition at line 291 of file CTSSAMethod.h. Referenced by calculateDerivatives(), calculateDerivativesX(), CCSPMethod::CSPImportanceIndex(), CCSPMethod::CSPParticipationIndex(), CCSPMethod::CSPradicalPointer(), CILDMMethod::deuflhard(), evalF(), CILDMMethod::initializeParameter(), CILDMModifiedMethod::initializeParameter(), integrationMethodStart(), CCSPMethod::predifineAnnotation(), CCSPMethod::setAnnotationM(), CILDMMethod::start(), CILDMModifiedMethod::start(), CCSPMethod::start(), CILDMMethod::step(), CILDMModifiedMethod::step(), and CCSPMethod::step(). Definition at line 296 of file CTSSAMethod.h. Definition at line 281 of file CTSSAMethod.h. Referenced by CILDMMethod::initializeParameter(), CILDMModifiedMethod::initializeParameter(), CILDMMethod::step(), and CILDMModifiedMethod::step(). Definition at line 316 of file CTSSAMethod.h. Definition at line 225 of file CTSSAMethod.h. Referenced by CILDMMethod::deuflhard(), mat_anal_metab(), CILDMMethod::newton(), CILDMMethod::step(), CILDMModifiedMethod::step(), and sylvester(). Definition at line 240 of file CTSSAMethod.h. Definition at line 230 of file CTSSAMethod.h. Referenced by CILDMMethod::deuflhard(), mat_anal_fast_space(), mat_anal_mod(), mat_anal_mod_space(), CILDMMethod::newton(), orthog(), CILDMMethod::step(), CILDMModifiedMethod::step(), and sylvester(). Definition at line 244 of file CTSSAMethod.h. Definition at line 200 of file CTSSAMethod.h. Referenced by CCSPMethod::cspstep(), integrationMethodStart(), integrationStep(), CILDMModifiedMethod::setVectors(), CILDMMethod::setVectors(), CCSPMethod::setVectors(), CCSPMethod::setVectorsToNaN(), CILDMMethod::step(), and CILDMModifiedMethod::step(). Definition at line 459 of file CTSSAMethod.h. Referenced by CILDMModifiedMethod::emptyVectors(), CILDMMethod::emptyVectors(), CCSPMethod::emptyVectors(), CILDMModifiedMethod::printResult(), CCSPMethod::printResult(), CILDMModifiedMethod::setAnnotationM(), CILDMMethod::setAnnotationM(), CCSPMethod::setAnnotationM(), CILDMModifiedMethod::setVectors(), CILDMMethod::setVectors(), CCSPMethod::setVectors(), and CCSPMethod::setVectorsToNaN(). Definition at line 461 of file CTSSAMethod.h. Referenced by CILDMModifiedMethod::emptyVectors(), CILDMMethod::emptyVectors(), CCSPMethod::emptyVectors(), getVec_TimeScale(), CILDMModifiedMethod::printResult(), CCSPMethod::printResult(), CILDMModifiedMethod::setAnnotationM(), CILDMMethod::setAnnotationM(), CCSPMethod::setAnnotationM(), CILDMModifiedMethod::setVectors(), CILDMMethod::setVectors(), CCSPMethod::setVectors(), and CCSPMethod::setVectorsToNaN(). Definition at line 276 of file CTSSAMethod.h. Referenced by CILDMModifiedMethod::deuflhard_metab(), mat_anal_fast_space(), mat_anal_fast_space_thomas(), CILDMModifiedMethod::setVectors(), CILDMMethod::setVectors(), CILDMMethod::start(), CILDMModifiedMethod::start(), and CILDMMethod::step(). Definition at line 261 of file CTSSAMethod.h. Referenced by CILDMMethod::initializeParameter(), CILDMModifiedMethod::initializeParameter(), mat_anal_mod(), CILDMModifiedMethod::setVectors(), CILDMMethod::setVectors(), CILDMMethod::start(), CILDMModifiedMethod::start(), CILDMMethod::step(), and CILDMModifiedMethod::step(). Definition at line 266 of file CTSSAMethod.h. Referenced by mat_anal_metab(), CILDMModifiedMethod::setVectors(), CILDMMethod::setVectors(), CILDMMethod::start(), and CILDMModifiedMethod::start(). Definition at line 271 of file CTSSAMethod.h. Referenced by mat_anal_mod_space(), CILDMModifiedMethod::setVectors(), CILDMMethod::setVectors(), CILDMMethod::start(), CILDMModifiedMethod::start(), and CILDMMethod::step(). Definition at line 185 of file CTSSAMethod.h. Referenced by CCSPMethod::cspstep(), integrationMethodStart(), integrationStep(), CILDMMethod::step(), and CILDMModifiedMethod::step(). Definition at line 256 of file CTSSAMethod.h. Referenced by CILDMModifiedMethod::deuflhard_metab(), CILDMModifiedMethod::newton_new(), and CILDMModifiedMethod::step(). Definition at line 195 of file CTSSAMethod.h. Referenced by CILDMMethod::deuflhard(), CILDMModifiedMethod::deuflhard_metab(), mat_anal_fast_space_thomas(), CILDMModifiedMethod::newton_for_timestep(), CILDMModifiedMethod::newton_new(), CILDMMethod::step(), and CILDMModifiedMethod::step(). Definition at line 190 of file CTSSAMethod.h. Definition at line 98 of file CTSSAMethod.h. Referenced by CILDMModifiedMethod::createAnnotationsM(), CILDMMethod::createAnnotationsM(), CCSPMethod::createAnnotationsM(), and getTableName().